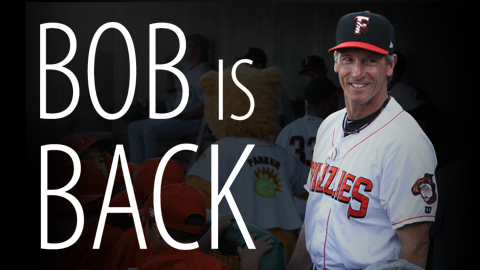 FRESNO, Calif. - The San Francisco Giants have announced Bob Mariano will return in 2014 for his third consecutive season as manager of the Class AAA Fresno Grizzlies. New hitting coach Andy Skeels and new pitching coach Dwight Bernard join Mariano, while James Petra will serve as athletic trainer and Brad Lawson as strength and conditioning coach. "Bob has a wealth of baseball experience and knowledge to share with our Fresno players and has shown success in preparing them for the jump to San Francisco," said San Francisco Giants VP and Assistant General Manager Bobby Evans. "We are excited to have him return as our manager with the Grizzlies." Mariano, 56, has compiled a 142-145 record in his first two seasons as skipper for the Grizzlies. In two seasons at Fresno, the Phoenix, Arizona native has managed 12 players who have received their first Major League callup to the Giants. The 2014 season will mark his sixth minor-league managerial campaign, 10th straight season with the Giants organization, and 35th overall in professional baseball. Skeels, 48, moves into his ninth season in San Francisco's organization and first as the hitting coach at Fresno. Most recently, Skeels served as the manager for the Class A San Jose Giants (2009, 2011-13) and led the team to a California league-best 83-57 record in 2013. His last hitting coach appointment within the organization came with the Class A Augusta GreenJackets (2006-07) where he worked with current organizational players Pablo Sandoval and Brett Pill. Skeels resides in Thousand Oaks, California. Bernard, 61, is a 28-year coaching veteran who begins his first season in the Giants organization. He spent the last 10 seasons serving as a pitching coach in the Seattle Mariners organization, most recently for Class AAA Tacoma Rainiers (2006-09, 2011-13). The Mount Vernon, Illinois native went 4-8 with a 4.14 ERA (81 ER/176.0 IP) over 115 Major League appearances for the New York Mets (1978-79) and Milwaukee Brewers (1981-82). He threw 1.0 scoreless IP for the Brewers in Game 6 of the 1982 World Series. Petra, 31, enters his sixth straight season in San Francisco's organization and first at Fresno. The 2004 University of Connecticut graduate most recently held the same position at Class AA Richmond Flying Squirrels for two seasons (2012-13) after beginning his Giants career with Augusta (2009) and San Jose (2010-11). Prior to the Giants, he spent 2007-08 as the assistant athletic trainer and head strength and conditioning coach for the Bowie Baysox, Class AA affiliate of the Baltimore Orioles. Petra resides in Richmond, Virginia. Lawson, 30, starts his third season in the Giants organization and first at Fresno after holding the same position with Richmond in 2013. Entering his sixth season in professional baseball, he previously worked for the Chicago Cubs and Washington Nationals after earning a degree in Kinesiology and Education from the University of New Brunswich (Frederiction, NB, Canada). He resides in Glenside, Pennsylvania. ABOUT THE FRESNO GRIZZLIES The Fresno Grizzlies enter their 17th season as the Class AAA affiliate of the San Francisco Giants when they return to Chukchansi Park on April 11, 2014 for their home opener. The Grizzlies are a member of the 16-team Pacific Coast League and compete in the four-team Pacific North Division with Reno, Sacramento and Tacoma. For information on current ticket plans, call 559-320-TIXS. This story was not subject to the approval of the National Association of Professional Baseball Leagues or its clubs.